The component parts in TJ6094 Radius Bar & Magnet are included with each Guide Kit and this pack is also available separately. 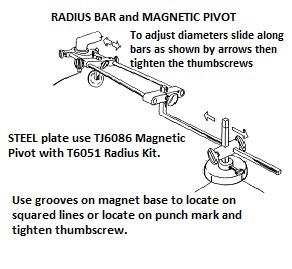 The TJ6086 Magnetic Pivot suits use with all Circle Guides by fitting directly to the Guide Frame, or it can be used with the TJ6051 Radius Bar for larger diameters. These plasma cutting accessories can also be used with the Tanjant Roller Guide, with some limitations. Radius Bars may be joined using the Link Nut to create longer lengths for very large diameters.